Crime plagues every corner of Winnipeg but residents in the city's William Whyte neighbourhood tend to hear the sirens from emergency vehicles more often than anyone else. A study by CBC News has found that neighbourhood, tucked into the city's North End, has the highest rate of reported crime in the past two years. And it's taking a toll on the people who call it home. "This year, the kids, they're just terrorizing everybody," said Gail Hastings, who has lived in William Whyte for 15 years. She spends many evenings sitting on her porch, watching the street as an unofficial neighbourhood watch guardian, and she's seen it all — robberies, muggings, assaults. Whenever she sees something happening, "I just reach over because I keep my phone with me all the time," she said. The average crime rate in William Whyte is triple that of many neighbourhoods and even quadruple the rate in others. Since January 2010, there have been 10 shootings, 95 residential break and enters, and nearly 90 robberies in the small area bordered by Alfred Avenue on the north and Selkirk Avenue to the south, Salter Street on the east and McGregor Street on the west. 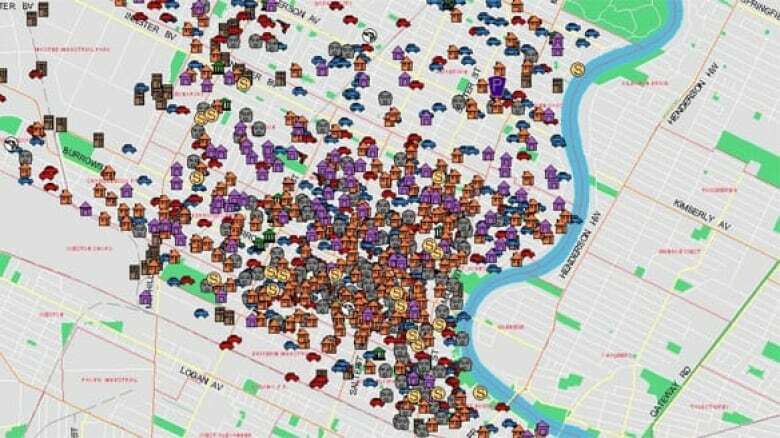 The statistics come from data collected by CrimeStat, on online feature of the Winnipeg Police Service's website, which provides weekly statistical information relating to crime in the city. It is important to note that Crimestat data reflects reported crime, which is subject to change pending investigation. For example, a report could come in about a shooting, which is later revealed to simply have been the sound of firecrackers. However, studying the data over a two-year period provides a clear indication of the overall trends in the city regarding reported sexual assaults, reported shootings, reported robberies, and reported homicides. Other neighbourhoods such as St. John's, Daniel McIntyre, North Point Douglas, and Spence all show high rates of reported crime, but none as high as in William Whyte. Rick Linden, a criminologist at the University of Manitoba, isn't surprised at the problems there. It's one of the city's poorest neighbourhoods, making it the perfect breeding ground for gangs and criminal behaviour, he said. "If we look the factors that put young people at risk for crime, we find that those elements are poverty, lack of education, family dysfunction, community dysfunction," he said. A Statistics Canada study echoes those findings and indicates the neighbourhood has been battling the problem for at least the past decade. The Statistics Canada study, done in 2001, analyzed the crime rate in a number of Winnipeg's inner city neighbourhoods. It determined the prime factors that contribute to crime, aside from those noted by Linden, include poor housing conditions, buildings and streets in poor repair, a lack of employment opportunities and a high proportion of single parents. William Whyte is bordered by Alfred Avenue on the north and Selkirk Avenue to the south, Salter Street on the east and McGregor Street on the west.